Exclusive Gifts Johannesburg Corporate Gifts Johannesburg is a supplier of gorgeous exclusive gifts that will make a stunning corporate gift for any occasion. Whether you’re looking to impress someone or show them how much you appreciate them and the work that they do, an exclusive gift is a wonderful way to do that. Gifts like these have a lot of thought behind them. They’re the kind of gifts that are given with reverence and respect, both for the thing being given and the person receiving it. Our range of beautiful Exclusive Gifts Johannesburg are sure to show your gratitude and appreciation. Parker Pens have 129 years in business and a founder with a long history of experience in the pen industry backing them up. They have been producing revolutionary, beautiful writing instruments since 1899. The timeless elegance of a Parker Pen is what makes it such a wonderful gift. Specialising in ballpoints and fountain pens. To this day they remain a leading brand of ink and pens around the world. Over the years, parker has been at the head of writing innovations, from crack-proof plastic pen casings to Quink, Parker’s pen cleaning, quick drying ink – the first to not need a blotter. If you’re looking for an exclusive pen that with a history of innovative design and beautiful craftsmanship then then you’re looking for Parker Pens. Cross Pens are stunning pens made in America. Their head office is in Lincoln, Rhode Island and they supply beautiful writing instruments. Cross was founded 171 years ago, in 1846 and are one of America’s premier pen suppliers. Cross has many collections of exquisite pens that range from simple, elegant designs to intricate, complex patterns across the barrels. The distinctive conical top of the cross pen has been a symbol of magnificent writing tools for a very long time. The Cross Pen Company even created the Stylographic pen, an industry first and the forerunner of the ballpoint pen. They have also been supplying the Whitehouse with pens since the 1970s and each president since that time has had a personalised range of Cross Pens with their signature. The practice of the President of the United States using Cross Pens dates back to the Gerald Ford Administration, though the official agreement was only begun during Bill Clinton’s time in office. Cross Townsend was the pen of choice for Clinton and George W Bush. 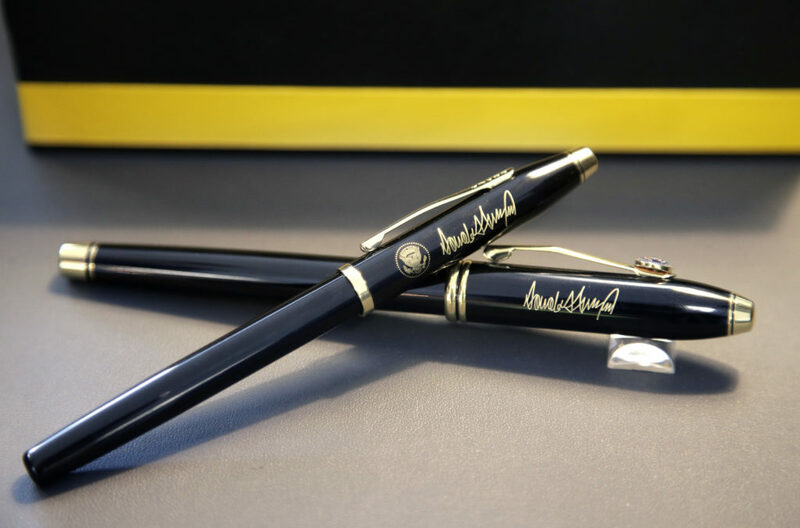 Obama started his first term with the Townsend, but later changed to the black lacquer Century II, a tradition which Donald Trump is now continuing, having placed an order for 150 Century II pens. These gorgeous pens also come with a lifetime mechanical guarantee, the only pen we stock to offer that. No matter how old your Cross pen, you can take it in for repairs if that should ever be necessary. This is how much faith the Cross brand has in their excellent craftsmanship. Cross pens also come out with stunning, limited edition pens for all sorts of different occasions, from the Chinese New Year (2017 is the year of the Rooster) to the release of the latest Star Wars movie. With over a century and a half of experience to their name, you can count on Cross Pens. Montblanc products are the epitome of quality and luxury. Having been in operation since 1906, Montblanc have put that signature snowflake logo of theirs to an incredible range of products. At Corporate Gifts Johannesburg we are delighted to offer you a range of Montblanc pens, bags, cufflinks, iPad and iPhone covers, leather wallets and notebooks. Their leather products are made from genuine European leather, one of their ladies wallets is made from genuine Russian Calfskin. All these products are buffed to give them the beautiful gloss that Montblanc products are so famous for. 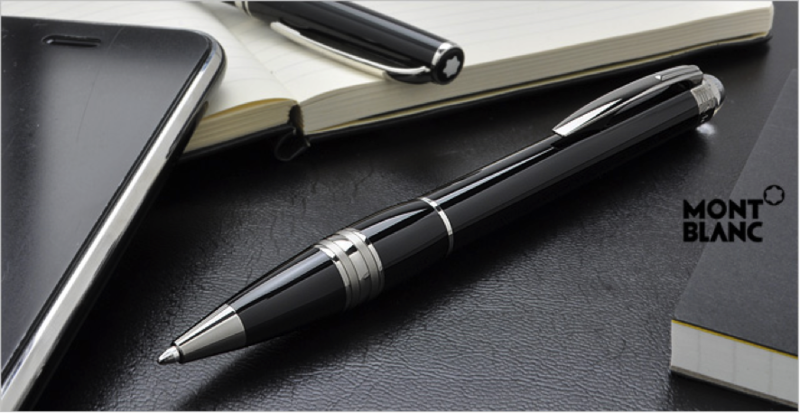 The most popular Montblanc pens are the Skywalker Midnight Black and the PIX, which has replaced our beloved Cruise. We are proud of the range of Montblanc products that we are able to offer. Many of the Montblanc barrels are made with a gorgeous, beautifully glossy precious resin. Due to the nature of this resin, we don’t engrave the pens themselves but rather a plaque that sits in the beautiful presentation box that comes with every Montblanc pen. Balmain Paris pens are one of the stunning products produced by the Balmain Paris fashion house. Balmain has a long and illustrious history of producing beautiful garments and equally beautiful pens. As a fashion house they have through the years adhered to a strong sense of aesthetics while still growing with the fashion industry. This kind of thinking is the same as they apply to their pen production, producing timeless, elegant pens that can be treasured throughout the years. Pens aren’t the only Balmain Products that we can offer you. Corporate Gifts Johannesburg can also offer you a beautiful range of Balmain Paris gifts sets that include gorgeous notebooks and USB drives. These sets make for beautiful, exclusive gifts and with them you can rest assured that you are giving someone a gift that encapsulates beauty, function and admiration, making Balmain Paris a truly stunning corporate present. A gift is something that has a lot of presence behind it. It has emotions that are connected to it. Gratitude, appreciation, admiration, and hope. When you give someone a gift there’s a little spark of hope in your chest because chances are that you really want them to like that gift. Seeing the look of joy and surprise on their face brings warmth to everyone around them. Giving someone a gift is more than just the object given, it’s the sentiment. With the range of exclusive gifts that we at Corporate Gifts Johannesburg you can clearly communicate your feelings. With us you can give someone a beautiful gift that they will treasure forever. We are proud purveyors of exclusive, Executive Gifts Johannesburg.